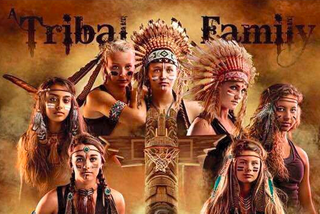 The Clarke High School (Iowa) Indians’ girls basketball 2016-17 team poster may be racist, but damned if it isn’t high-quality racism. Now, if you’re in the same camp as a large swath of the commenters on Garman’s post, you might want to direct your vitriol at this group of 14- to 18-year-old girls and their coaches. You wouldn’t be misguided—after all, they’re the ones who opted for the theme. But Ben Shirk, the owner and head photographer for Shirk Photography, the company in charge of the shoot, told me the ideas were crafted by the company, not the high school. Clarke High School simply told Shirk they were looking for a poster incorporating their mascot; the poster as you see it is what Shirk came up with. Shirk informed me the finished product was less inflammatory than some of the ideas that were put on the table. He said the project seemed no different than a superhero- or samurai-themed poster, saying there’s nothing racist about totem poles and war dances. Clarke Community Schools Superintendent Steve Seid offered a similar sentiment when reached for comment by KCCI. The station also reported that none of the girls shown are of Native descent.